By 2018 IITA Socioeconomics and Natural Resource Management teams estimate that the Institute would have already lifted 7.2 million people out of poverty and rehabilitated 875,500 ha of degraded land. These are efforts towards realization of the Institute’s vision of lifting 7.5 million people out of poverty and rehabilitating 10.5 million of degraded land and transforming Africa’s agriculture. The IITA score card was presented by the IITA Director General Nteranya Sanginga during the opening session of this year’s P4D Week held in Ibadan, Nigeria with the theme ‘Beyond Research’ and focused on ongoing initiatives on the scaling up and out of IITA technologies. 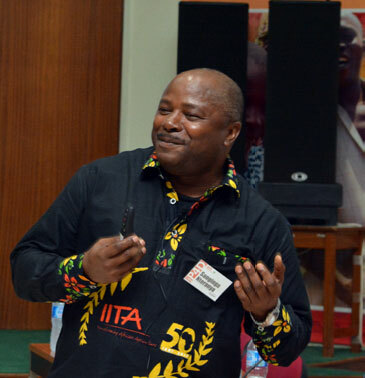 Sanginga started by updating the staff and the Board on progress made in the implementation of IITA’s 2012–2020 strategy. He noted that the Institute was now in the third phase of the strategy from 2018 to 2020 which included reflecting on the failures and successes over the past 6 years and looking at and preparing for the next 10 years. “Through initiatives such as the Technologies for African Agricultural Transformation (TAAT) and Business Incubation Platform (BIP), IITA is well on the path to integrate its Research for Development (R4D) and P4D agenda. IITA is well aligned to the CGIAR business plan’s strategic objective of engaging external delivery partners,” Sanginga said. He also noted IITA was well on track to becoming a project-based institution. While core funding had been decreasing gradually, project funding has been on an increase. He said the Institute would continue with aggressive fundraising to counter the dwindling funds to its core budget and urged scientists to not only engage in the fundraising efforts but also in implementation to ensure IITA is able to make use of the overhead budget for its core activities. 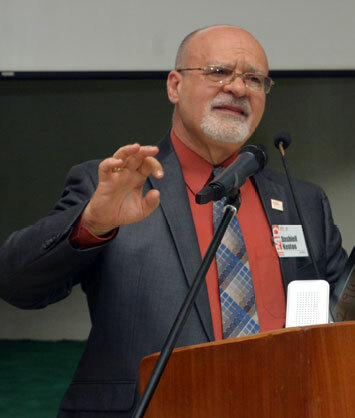 While welcoming the participants to the event, IITA Deputy Director General (DDG-P4D) Ken Dashiell also reiterated the importance of integrating IITA’s P4D and R4D. Dashiell noted that R4D was the heart and soul of IITA and its achievements have made IITA a viable and successful organization. He said that R4D has developed many technologies for the chains of cowpea, soybean, maize, cassava, yam, banana and plantain, and demonstrated the success of these technologies. However, Dashiell said the delivery of these technologies through partnership is critical to enable IITA to deliver on its promises, which include increasing yields of cassava, yam, maize, banana and plantain, soybean, and cowpea by 60%, increasing average farm income by 50%, reducing the number of malnourished children by 30%, and reducing poverty and restoring degrading farm lands. The previous P4D Week was held in 2016 and this week’s event built on the lessons learned during and since 2016.